Whether you want to show your dedication to your favorite sports team, career, faith or make someone smile (or even laugh), Trenz Shirt Company has thousands of t-shirts and apparel for the whole family! There truly is something for everyone as they have many categories of t-shirts. 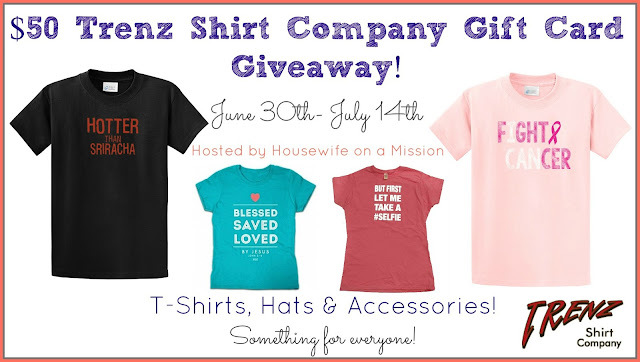 Trenz Shirt Company makes it easy for gifting to love ones, and since they have something for everyone, it's a one stop shop! At Trenz Shirt Company, they have all your needs covered from head to toe-- whether it be Pop Culture, music, occupational or the ever popular Funny T-Shirts, Military T-Shirts or Christian themed gear. They offer a line of Christian t-shirts, jewelry and novelty accessories for every family member and friend . These selections makes Trenz your one stop shopping destination to demonstrate you are not just a follower but a fan of your favorite line of clothing! There is something for everyone as they continually change with the times at Trenz (adapted from http://www.trenzshirts.com). I think this would be a great gift or great for back to school. Reviewz & Newz is helping promote this giveaway and is not respsonsible for shipment of prizes. One lucky reader will win a $50 gift card to Trenz Shirt Company! Wow! There are so many to choose from. I really like the Super Mario tshirt.